When you are working with your contractor to design your custom home, your roof may be one of the most important choices you make. Not only will the roof have a big impact on the overall look of the home, but it will also have a big influence on the longevity of your home and how well iy regulates energy. Some roofs require more maintenance than others. They must be cleaned regularly to prevent the growth of moss and mildew, and it must be inspected annually to ensure that none of the shingles have shifted or the underlayment has broken down. Roofs that require more maintenance may also put your home at greater risk since damages are more likely to happen if you are not vigilant. Replacing a roof can be quite expensive, so you want to minimize the number of times you will have to do it. The best way to do that is to choose a roof with a longer lifespan and to properly maintain it. Popular asphalt shingle roofs can last from 15 to 30 years. Clay tile roofs can last up to 50 years. Foam roofing can last a lifetime — at least a century or more. Make sure you understand how long each roof that you are considering is expected to last. Some roofs will break down faster in certain conditions. For example, if your property is heavily shaded, your roof is likely to get more moss and mildew because of the damp conditions. Therefore, you’ll need to choose a roof that is more resistant to moisture. Discuss your options with your contractor, who can alert you to the conditions on your property that could influence the health of your roof. 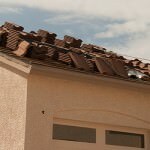 Your roof can take a beating from the conditions of your local climate. For example, if you live in a place with extreme heats in the summer and extreme cold in the winter, you’ll need a material that can withstand the contraction and expansion without breaking down. Tile is a good option. If you live in a place that gets heavy rains and winds during the summer and heavy snow during the winter, you’ll need a roof that is strong and sturdy. Yalk to your contractor about your choices. Your contractor will let you know how different materials perform and give you recommendations that are suitable for your local climate. Not every roof type is suitable for every home. For example, foam roofing cannot be applied to homes that have steep-pitched roofs. Clay tile and slate require a strong support structure below the roof. These are issues that you can’t know without talking to your contractor. Fortunately, if you have these discussions while you are still designing your home, you can make adjustments to the design to accommodate the roof you want. Therefore, if you want a slate roof, the contractor can make changes to the architectural plan to include the right support for the weight. Of course, your roof will have a big impact on the look of your home. When you choose to design a custom home, you do so because you have a very specific idea about the way you want your home to look. Make sure you choose your roof with the overall look of your home in mind. Beautiful stone materials like slate will not only make your home look gorgeous but will also significantly increase its value. Materials like wood shake can give your home a quaint and rustic look. Explore all your options to make sure you are getting the look you want. The materials you choose for your home not only impact the energy it consumes but also the environmental footprint it makes. For example, a metal roof is very energy-efficient, and it is also good for the environment since it can be recycled. Other eco-friendly options include solar roofs and green roofs — those that actually plant a garden on the roof. Take advantage of the opportunity that building a custom home offers you and get exactly what you want and need in your roof. The right choice will save you a lot of money in the long run, as well as increasing the value of your home by improving its energy efficiency and enhancing its look. I had no idea that there was so much to consider when looking at building a rood. You’re right, though, it is a very important decision. We’ll be sure to look at the tips you gave, especially the life span. Thanks for sharing. I really appreciate these guidelines on picking the best roof for a home. My husband and I are in the middle of building a home, and we of course want to make sure that it is the best option possible. I knew the roof was important to the look of the home, but I didn’t realize it could actually help the longevity of the home as well. Thank you for this information! My wife and I are planning our first house, and while I’ve always had shingle roofs up to now, I’d really like to try something else, like slate. I like that it adds a lot of value to the home, as you said. Can slate roofing withstand high and low temperatures? Focusing on using sustainable materials when building a roof for a custom home seems like very good advice. One of the main issues that I’ve been trying to achieve when building this new home is by making it more energy efficient. Having a roof that’s made from energy efficient materials that can be recycled seems like a good way to meet my goals to make my new home more sustainable. I really like the advice you give here of making sure you pay close attention to the climate of where you live as well as the conditions of your property to design and pick your roof. It is also interesting to me that you mention the importance of working with your contractor to make sure all these details and specifics are done correctly. My husband and I have been wanting a new roof but haven’t known how to do it while making sure that it was done right, so it sounds like a roofing contractor might be the best way to make sure it is done correctly. I will be sure to let my husband know, thanks for sharing this!